This book is delightful. It is full of delights. Good books are usually difficult to describe (because what makes them good is their distinctiveness), but I will try not to fall into "this is good, you have to read it", which is what comes most naturally at the moment, but which is not always terribly persuasive. 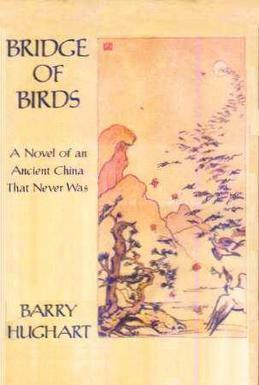 The story is set in what I can only describe as the idea of ancient China. It has the very fitting subtitle "A Novel of an Ancient China That Never Was", which neatly hints (to me, at any rate) at precisely this setting in the Idea, rather than any accurate depiction of the historical period. It is not alternative history, per se; rather, it draws on history, fairy tales and heavily ingrained Western stereotypes of Chinese wisdom, to create a beautiful, ludic, funny novel. There is a sage with a slight flaw in his character, a scary Duke of Chi'in, monsters, ghosts, legends, a misplaced piece of the Great Wall, cryptic clues, a cave of music and an Old Man of the Mountain. The language is occasionally delicious, and always good. It is lyric and playful in turns and the whimsical style appealed to me from the beginning. Fitting perfectly into my idea of China, there is a definite fascination with lists of strange things, but this never detracts from the narrative. What I found most tiresome was the incessant need to travel from one place to another, and return at regular intervals to the village; but I can see how it was necessary to the plot. I was somewhat disturbed, in the beginning, but the apparent episodic tendency of the book. It seemed to be based around plot coupons, and to have embraced this lack of plotting in the introduction of a series of moments of sheer whimsy. This was counterbalanced fairly quickly, however, by indications that there was a plan to it which would draw together things I could not connect. Much of the apparent whimsy came together and turned out to have purpose in the end, and that does not detract from its delightfulness in my view. I like a well spun plot. That said, there is much in the book which signals a love for the strangeness of language, a rejection of conventional logic, and certainly the idea that what is perhaps most coveted in the world of Sensible People is not worth the cost and that wisdom and Wisdom are rather distinct. It is a counter-current novel; it is easy to read, yet strangely erudite; it is fantasy mixed with history; and it is a Postmodern Western take on Ancient China.